Where a corridor joins with the Swoop Hangar. In the corridor to the Crew Quarters where you find Mission. Where the corridor between the cockpit and the central chamber joins with the navigation room. Once you have found her you can try to decipher her language for 60 XP, or you can kick her out for some dark side points. You can always kick her out after deciphering her language, so you might as well figure out what she's saying before kicking her out. For the most dark side points don't kick her out until you tell Lur Arka that you will do so. Deciphering her language does an intelligence check, so you may want to use force valor to increase your chances. Deciphering her language can be done with a low intelligence, but it will go faster the higher your intelligence is. Once you have deciphered her language you can talk to her to find out she came from Dantooine. Return there, and talk to Lur Arka who should be standing in the docking area. Convince him that it is the girl he is looking for by telling him that she speaks a smattering of Mandalorian. At this point you can tell him to give you money if he wants to see the girl for some dark side points OR you can just let him on board. When you hand her over to Lur Arka you will gain light side points and 310 XP either way, so you can extort money from him and still come out even. If don't do anything about her until before you board the Leviathan, she'll actually leave the ship on whatever planet you are currently on, thus prematurely terminating this quest, which means you won't gain any more XP. Well, at least you got rid of her, eh? You get this quest on Tatooine when you meet a dockworker before you leave the Anchorhead docks. You really cannot avoid getting this quest, but you don't have to complete it. There are several ways to complete it, but the easiest is to simply buy Gizka poison for 350 Credits from Mic'Tunan'Jus in that dock area, or from Eli Gand on Kashyyyk. 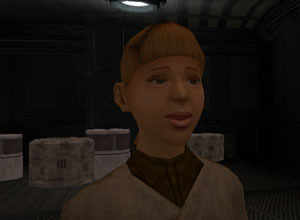 Feed the Gizka the poison for 560 XP and then leave the ship, the next time you enter they will all be gone. The second way nets you less XP, but can save you money, and in certain cases even make you money. Go to Manaan where you can find Nubassa in the docking bay area. Talk to him (her?) to learn that he is looking for exotic animals for a display. On first hearing that you have Gizka he won't want to take them off of your hands. You can however persuade him to take them off your hands by either force persuading him or with a successful medium persuade check (you'll get DSP if you lie here). Once you persuade him to take them off your hands he will ask you for 100 credits in return unless you lie about them previously. You can immediately pay, but you should at least try to persuade him not to pay since it is no more difficult than the first persuasion check (again medium difficulty). 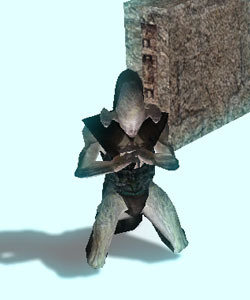 If you've invested a lot of points in persuade try to have him pay you for the Gizka, but it will be difficult (a high persuade check is required here). Force persuasion is not a good choice here as you need dominate mind, and you'll end up not having to pay, but you won't get any money either (very bad). On the other hand if you lied to him earlier an easy persuade check is sufficient to have him pay you. In any case you'll either get some money for your efforts or you won't have to pay a dime. So to sum up, you can either immediately solve this quest by losing 350 credits to gain 560 XP OR you can gain no credits or 100 credits and also get 500 XP in the process. Whichever you choose you'll finally be freed of those pesky Gizka on your ship. If you don't do anything about the Gizka until the Unknown world, they will all leave the ship en-mass, at which point the quest will self terminate. On Korriban Lurze Kesh is a member of the Exchange, waiting for a shipment that Davik has yet to deliver. If you talk to him he mistakes you as one of Davik's goons, and demands that you hand over the spice. You obviously don't have any to hand over, so after a short discussion he asks you to look for a locked container containing spice on the Ebon Hawk. You might as well agree, as you don't have anything to lose, nor will you get any DSP for it, and one can always use the credits. For the first few riddle's he'll guess correctly, but eventually he'll mess up. One that always trips him up is the riddle asking how many are going to Dantooine. For winning the riddle game you'll return back to your body and gain no XP. None? Yep, none. But hey it was fun right? Well maybe not if you went ahead and read all of the answers, but what the heck. By the way, if you keep the box until you get to the Unknown world, you won't be able to enter it or deliver it (obviously), so don't forget to deliver it. Anyways head over to Swoop Registration on Tatooine and talk to Motta the Hutt for your reward of 2000 Credits, 2500 Credits with a successful persuade check or force persuade. Strangely enough you only get XP if you try to persuade him to pay you more and FAIL, either that or say that you're keeping the box until you get a better price. Either way the programmers forgot to include an XP reward for the other cases, unless you download the bug-fix located here. At least you got paid right?